Linda: It's fun being the wife of a famous composer. Cole: It's much more fun being the husband of such a beautiful girl. It's not too tough to figure out what the thinking was on giving this project the green light, back in the day�the execs at Warner Bros. no doubt wanted to replicate the success they had with Yankee Doodle Dandy, so they got the same director (Michael Curtiz) to sign on to do another biopic about a famous American songwriter—substitute one big movie star (Cary Grant for James Cagney) and the subject to be lionized (Cole Porter for George M. Cohan), and off we go. Similarly, it's easy to see how this movie found its spot, all these years later, on the Warner DVD release calendar—no doubt it's timed to coincide with the theatrical release of De-Lovely, another Porter biography. So with the director, the star, the songs, all the cinematic stars should be aligned, right? Actually, no. Even if we forget what biographers have told us about Porter—his homosexuality, his temperament—Night and Day is a pretty tepid movie. Goodness knows it's not all bad—it couldn't hardly be, given the presence of Grant and Porter's songs—but no one's going to London just to ride a pony here. The story is told in a completely conventional manner—Porter, son of Indiana aristocracy, disappoints his beloved grandfather by dropping out of Yale Law School and opting not to go into the unspecified family business, because he wants to write music. And he does so, with great success—he overcomes the inevitable obstacles (e.g., the sinking of the Lusitania metaphorically also torpedoes his first opening night), and triumphs as the toast of Broadway. And of course there's a girl—Alexis Smith plays Linda, the pretty little bad penny who keeps popping up. Porter does his duty for his country by serving in the war to end all wars; his tenure in Europe ignites his lifelong passion for Paris. And then it's triumph, triumph, triumph—he finally does marry Linda, but he chooses work over love, and she leaves him, for a time, as he loves Broadway more than he loves her. A sappy third-act tension, involving Porter being thrown from a horse and a triumphant return to Yale, is the ending imposed onto the story. There are some notable supporting players, including Porter's professor and producing partner Monty Wooley as himself; he's probably most famous for being the original Sheridan Whiteside in The Man Who Came to Dinner. Similarly, Mary Martin plays herself, presumably so she can re-create her signature song, My Heart Belongs To Daddy. And sacre bleu, who eez eet weez an accent so theeck you could spread it on a baguette but Eve Arden! Alexis Smith, as Linda, is supposed to represent hearth and home; she's a warm presence, but the undying love between her and Porter never really ignites on screen. Image Transfer Review: The film is of historical interest cinematographically, as it's the first Cary Grant picture shot in color; you can feel Curtiz finding his way with the Technicolor palette. His early efforts haven't been done any favors with this transfer, though, which is full of scratches, dirt, the hugest reel change indicators I've ever seen, and badly faded colors. Audio Transfer Review: There are some major imbalances on the mono track; the musical numbers are full of bass and lacking in treble, and they're recorded at an insanely loud level, whereas some of the dialogue scenes are little but hiss and mumbling. Have your finger ready on the button for the subtitles; you may need them. Extras Review: The few extras on the disc each have a good amount of sparkle. Musical Movieland (20m:20s) is a look at the dream factory, basically a tour of the Warner backlot set to music. Made in 1944, years before the Universal Studios tour, this had to be a kick for original audiences, this look at Hollywood full of singing cowboys and cops. Next, there's some 'splainin' to do, as we visit with Desi Arnaz and His Orchestra (10m:07s), in a pre-television incarnation; Arnaz is handsome and charismatic, and even favors us with a version of Babalu. Elmer chases Bugs all over the place in a Sisyphean effort, a typically wonderful Looney Tune called The Big Snooze (07m:19s); a quintet of trailers for Cole Porter musicals rounds out the package. Cole Porter is one of the great American songwriters, but this first stab at bringing his life to the screen is a toy balloon that's fated soon to pop. 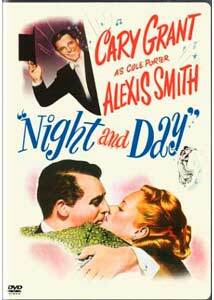 Cary Grant is inevitably dashing, but this isn't his finest hour; and if you want to revel in Porter's music and lyrics, get the CD player going instead.